The Hankook Dynapro HT RH12 premium highway all-season radial provides long tread life, low rolling resistance, and all-weather capability for your truck, van or SUV. Wide, computer-generated tread enables better mileage, less noise and excellent grip. 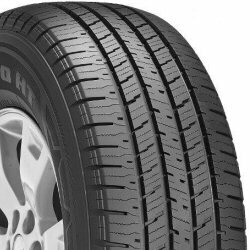 M+S rated, non-directional tread features four circumferential grooves for proper water drainage and anti-hydroplaning. Interlocking intermediate tread blocks provide good wet/snow traction while maintaining block stability and rib stiffness for good handling characteristics. High-stiffness center tread rib enhances steering response. Multi-depth lateral lugs further enhance wet and snow traction throughout the Dynapro HT's entire treadlife. Available in H & T speed ratings for P-metric sizes / S,Q & R speed ratings for LT sizes. Outline white lettering (OWL) available where noted. UTQG: 700 A B (P-metric sizes only, excludes LT series tires). 70,000 mile limited treadwear warranty on P-Metric sizes (see manufacturer's website for details). 40,000 mile limited treadwear warranty on LT sizes (see manufacturer's website for details). Road Hazard Warranty included (P-Metric sizes only, eligible only during first 2/32 of original tread life - see manufacturer's website for details). The Hankook Dynapro HT RH12 is available in 15 through 20 inch wheel sizes and 55 through 85 series aspect ratios.